For those of you who can't make it to a workshop, here is an online tutorial! 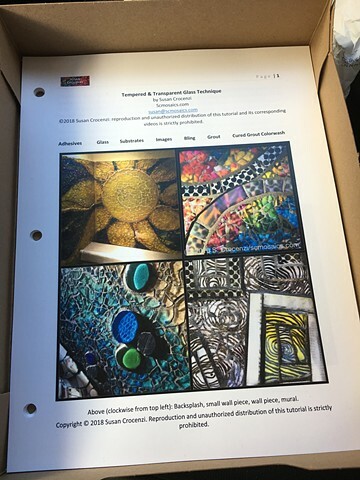 This Tempered Glass Mosaic Tutorial is 32 pages with more than 60 photos, more than 15 live links to purchasing info and/or more information. It is an automatic download PDF file/2.45MB. 1.) Eleven videos of me (actually my hands) making a single 8x8" tempered glass piece. The videos (slightly amateurish--I am a 1-woman operation and a video novice!) cover: priming wood, paints, image prep, several ways to break tempered glass, simple glass cuts, glitter, float glass, adhesives and how I use them, mixing colored grout, multi-color grouting, and cured grout color/glimmerwash. Click here for more info and/or to purchase!